The Centre for Health and the Public Interest (CHPI) was founded in 2012 after it became clear that a growing democratic deficit had emerged in the way decisions about health and social care policy were being made. Policy making had become opaque and centralised, with an increasing number of inappropriate conflicts of interest being tolerated. The need for an independent public-interest think-tank on health and social care policy was brought into sharp focus when the Health and Social Care Bill was introduced in 2011 to dismantle many of the founding principles of the NHS, including the constitutional duty of the Secretary of State for Health to provide healthcare for all. Since then, the NHS and social care sector has been subjected to funding cuts, privatisations and a series of top-down reorganisations that have harmed the efficiency and effectiveness of the system, demoralised NHS staff and worsened the experience of care for patients and their families. No other evidence-based and independent research body currently exists to present a critical view of the far-reaching and ongoing changes imposed upon the NHS since 2012. The aim of the Centre is to subject current policy to careful, evidence-based critical scrutiny; explore alternative solutions to the challenges of providing universal high quality health and social care; promote greater democratic determination and accountability in the organisation and delivery of health and social care; and advocate for probity, integrity and transparency in health policy-making. The Centre for Health and the Public Interest mainly conducts research and analysis. We also seek to influence policy by presenting our work to government, the Department of Health, MPs in Parliament, the Health Select Committee, the Public Accounts Committee, the Care Quality Commission and other relevant bodies. We take care to make our work accessible and useful for the general public as well. Most of the work is produced by our Research Officer, Vivek Kotecha, plus members of CHPI’s Executive Management Team, working pro bono. We also commission reports, analyses and blogs from a wide range of clinical and non-clinical experts. We accept funding only from independent organisations and individuals. We do not accept funding from any private organisation which has a financial interest in the provision of health or social care services. We rely on funding from charitable bodies and are constantly working to expand our crucially important base of individual donors. We gratefully acknowledge the grants for our work which have come from the following organisations: The Barry Amiel and Norman Melburn Trust, The BetterWorld Trust, Doctors for the NHS, The Lipman-Miliband Trust, The Marmot Charitable Trust, and The Scurrah Wainright Charitable Trust. CHPI is committed to financial transparency in the way it operates and has a policy of disclosing all donations over £2.5k in our Annual Report as filed at Companies House. In 2018, thinktank financial transparency initiative Transparify awarded us their top 5-star rating. CHPI is a registered charity governed by a board of seven directors, of whom five constitute an Executive Management Team. 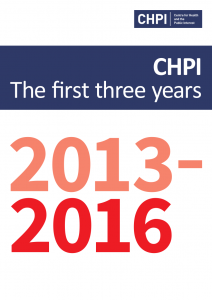 A highly valued group of distinguished people has backed the CHPI since its foundation in 2012: Professor John Ashton, Professor Sir Mansel Aylward, Sir Kenneth Calman, Professor Simon Capewell, Professor David Colquhoun, Professor Colin Crouch, Professor Danny Dorling, Dame Karen Dunnell, Dr Clare Gerada, Dr Julian Tudor Hart, Professor Walter Holland, Dr Richard Horton, Lord Frank Judd, Baroness Helena Kennedy, Professor Baroness Ruth Lister, Professor David Marquand, Professor Martin McKee, Lord Nic Rea, Professor Dai Smith, and Professor Alan Walker. CHPI is grateful for the receipt of accounting software and support from Accounts & Legal.